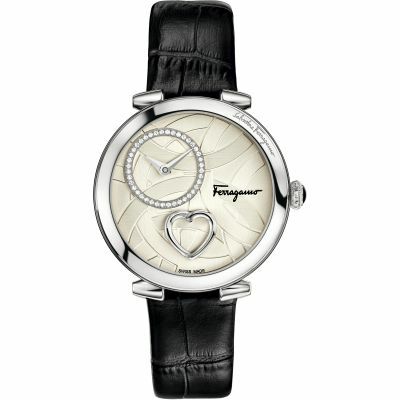 Cuore Ferragamo is the perfect accessory to seal a bond of love and the ideal gift to mark a special occasion. Its distinguishing feature is a dial decorated with a heart, which beats once a second as its two halves separate and then reunite, driven by a patented quartz movement. This movement was designed by and manufactured exclusively for Salvatore Ferragamo. This version is the PVD rose plated stainless steel execution, with black leather strap, and a cream patterned dial with the patented heart feature, offset time surrounded by 40 sparkling diamonds.